One of the biggest struggles that was very unexpected though, was nurturing the bond between the sibling and our NICU patient. Many of our concerns were related to our oldest child at home. Who will be with him while we’re in the NICU? Will he understand what’s really going on? What will he do in the hospital around all the medical equipment? Will he be afraid of all the machines? Will he still feel loved? These are just a several of the questions that swirled around in our minds as we navigated through this difficult time and prepared to finally be together as a family of four for the first time. This was the moment we realized what a valuable resource a child life specialist would be for our family in making this transition. Here are some things we learned with the help and support of this valuable resource. We talked to our older son ahead of time about how important it was that he be a good boy, not touch anything, wash his hands, and be a good listener. We tried to explain to him that this brother of his loved him and would soon be living with us and how exciting that was. I still felt that we fell short of helping Mason understand the importance of this visit and the start of this relationship but our child life specialist, Emily Kittell, saved the day. 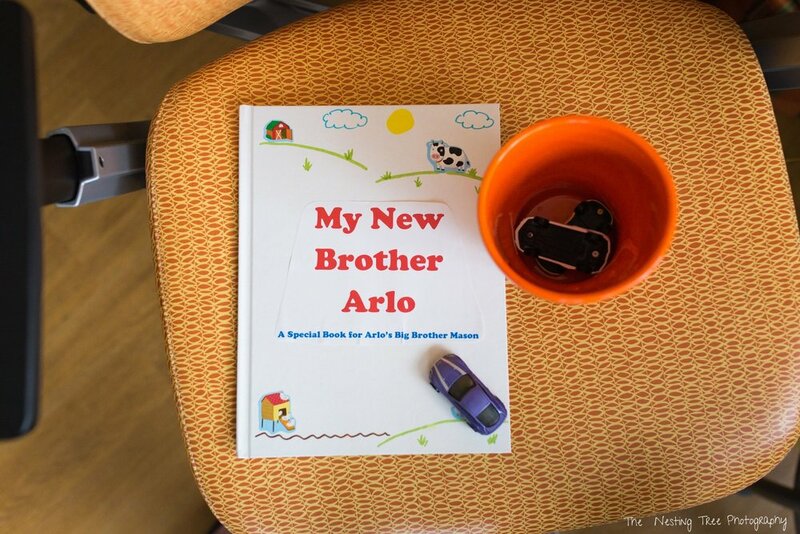 Emily came prepared with a book for Mason about his little brother Arlo. It showed pictures of Arlo in his hospital bed and explained that the machines were all helping him. She gave gifts that Mason could give his brother and a special bag of tricks for him to keep as well. This included simple toys like a Mr. Potato Head, cars, and lacing practice cards to help hold his attention. Big brother Mason, age 3, is introduced to certified child life specialist, Emily Kittell, outside of the NICU at Children's Hospital of Wisconsin. Emily provides Mason with a personalized book to help prepare him to meet his brother for the first time and feel included. 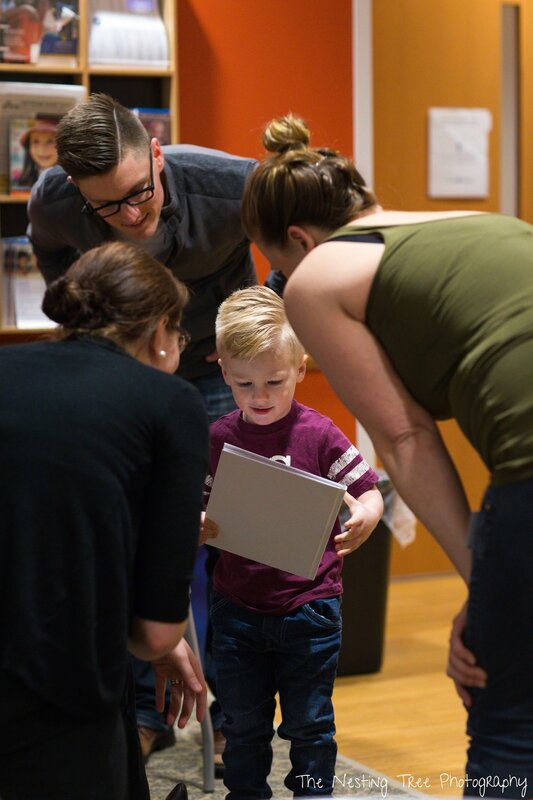 Emily Kittell, child life specialist, presents personalized book to baby Arlo's big brother, Mason, and their parents outside of the NICU. Personalized sibling book created by Certified Child Life Specialist, Emily Kittell. Pictures of the hospital, medical equipment and his newborn brother were included to help Mason understand what he would see, hear, and possible touch that were all being used to help care for baby Arlo. Even with both my husband and I there in the waiting room with my older son, we still felt worried about bringing him into the NICU room. If I was with the baby, and my husband was with our big boy, what would we do if he needed redirection? 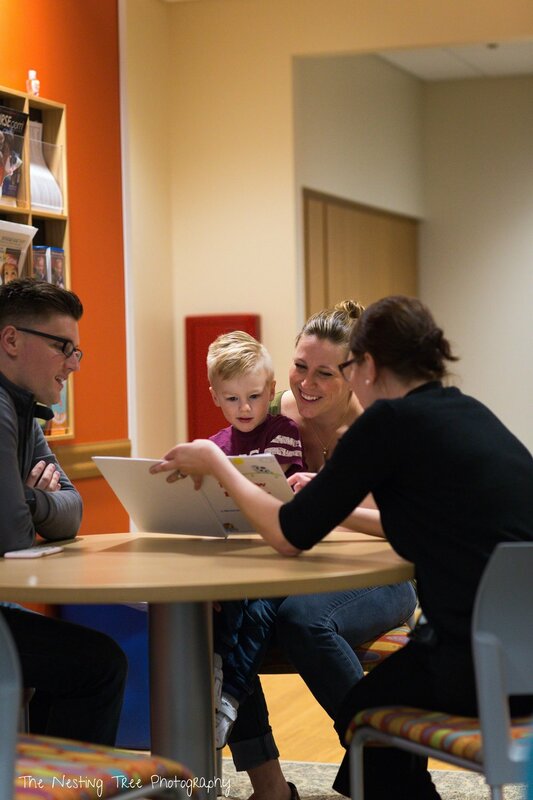 Knowing that a child life specialist was there with us was very reassuring in the chance that either boy needed a little extra attention or suggestions for how to engage with one another. With the IV lines, feeding tube, heart rate monitor, pulse ox cord, and more, sometimes even getting up from the chair or other simple tasks occupy your mind and body. At first I felt a bit uncomfortable with the child life specialist there and was prepared to be interviewed or make sure big boy Mason was behaving. After she untangled cords and tubes for me and picked up on Mason’s curious clues that he was looking for some ways to interact, I felt such a sense of gratitude with the realization that she was truly just there to help us in this transition and offer her ideas. I’ve been a teacher 9 years and pride myself in my creativity and fun and positive disposition. I like to take regular situations and make them memorable and applicable to young kids so that they feel important. I could pull tricks out of my back pocket while waiting in line, sitting at a restaurant, or during playdates. The NICU, however, gave me blinders. I was not a teacher. I was not a goofy grown up to play alongside. I was a scared and anxious mom trying to make the best of out a very difficult situation. I immediately fell short of ideas to distract, redirect, or console. This is why we were so thankful to have a child life specialist present with our family for this sibling visit. I recognized that she had a background in childhood development and knew just what to do to redirect us towards our goal of making meaningful connections. As soon as my radar would go off with worry that Mason was about to run or want to climb or pull or get his wiggles out, a new item came out of the bag or a new conversation was started. We were beaming with delight that someone else could give Mason a role in this situation so that he could feel empowered and I could focus on the fragile NICU responsibilities. 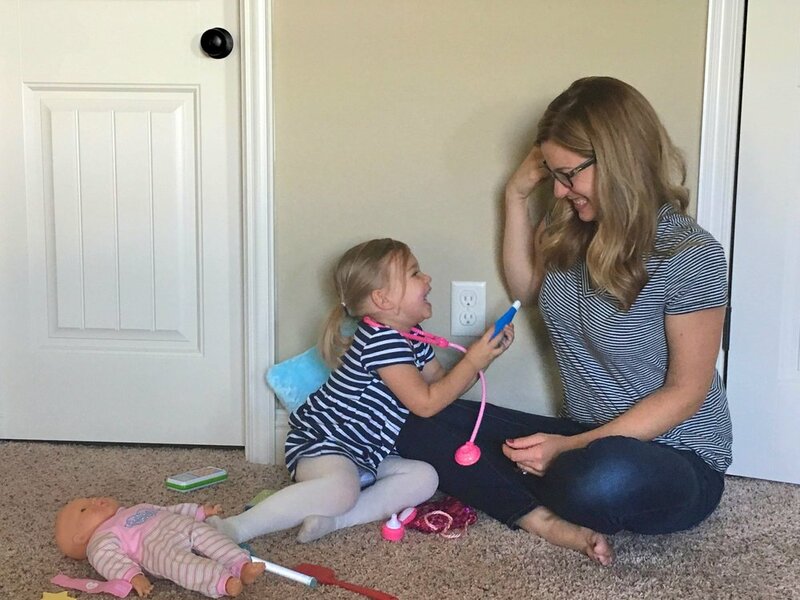 I remember feeling like we lived two separate lives: our life at home with our three year old, and our NICU life with our newborn. Nothing prepared me for the anticipation and excitement that I felt when all four of our hearts could all be together in one room for the the first time. It wasn’t perfect. At points it felt sloppy. The time felt short and I had other responsibilities while I tried to be present. But we were together. We tried our best and our Child Life Specialist was there to help us connect the dots and pick up the pieces (literally when clean up time came). It became a beautiful blend of giving him one one one attention or walking down the hallway to give us a break, driving cars along the window ledge in a world of imagination, or really finding ways to help him engage with his brother when appropriate. Some of his big brother tasks included giving his little brother a pacifier, putting a hat on his head, or even giving Arlo a q-tip treat. We were allowed to give Arlo tastes of breast milk on his lips and tongue with a q-tip and Mason took great pride in helping with this. Our child life specialist’s presence warmed our hearts and we will always have a very positive memory of this visit because of her. The homecoming was a similar transition to the sibling NICU visits. We wanted to use the tips we gained from our Child Life Specialist in our own way and make both boys feel loved and that they were getting our undivided attention. I have to say after almost two years since bringing our NICU baby home, we still depend on ideas from others for how to tackle sticky situations. I’ve struggled with keeping Mason busy while I needed to pump and prepare for his brother’s tube feedings, find energy and activities for the day when I was sleep deprived with our newborn, etc. We have utilized many tips, tricks, and resources through Dawn from Doseofplay.com to help in these situations. 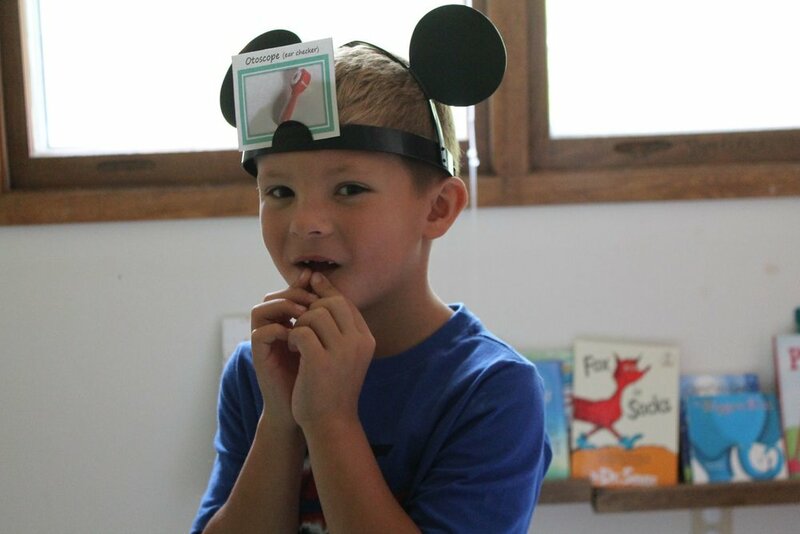 She shares many great ideas on how to distract little ones while completing important tasks, great games, toys and apps that help hold little attention spans, and so many more awesome ideas. We are so thankful to have had a hospital that offered child life services and have depended on them since then due to some accidents resulting in stitches and multiple procedures and hospitalizations. While at home, though, Dose of Play is our go to resource that we utilize and continue to share with others to help our little ones feel loved and important each day. Big brother Mason showing his new baby brother Arlo how to use the pacifier he got for him. Now it’s your turn… Dose of Play and Little Birch are happy to announce a giveaway that will allow you to see the benefits of these items first hand! Be sure to follow Dose of Play and Little Birch on Instagram for a chance to win! Giveaway runs from March 8th, 2018 at 0700 CST and closes at 11:59 CST on March 11th.